Order picking methods are defined in terms of: (a) pickers per order - the number of pickers that work on a single order at one time; (b) lines per pick - the number of orders a single item is picked for at one time; and (c) periods per shift - the frequency of order scheduling during one shift. The most common type of order picking because it is basic and simple to understand. When employing a discrete order picking methodology, one order-picker picks one order, one line at a time. Additionally, there is only one order scheduling window during a shift. Therefore, orders are not scheduled and may be picked at any time on a particular day. Order pickers are assigned a specific and physically defined zone in the pick area. The picker assigned to each zone is responsible for picking all of the SKUs located in the zone for each order. In the event that an order requires SKUs that are located in multiple zones, the order is filled after it passes through each zone. This is also referred to as the "pick and pass" methodology. In zone picking there is only one scheduling period per shift. This means there is a cutoff point for orders to be queued into the order picking process and any order received after that cutoff point will get fulfilled during the next shift. Batch picking is when one picker picks a group, or batch, of orders at the same time, one SKU at a time. This is advantageous when there are multiple orders with the same SKU. When that occurs, the order picker only needs to travel to the pick location for that specific SKU once, in order to fill the multiple orders. The main advantage for choosing this method is reduced travel time, which increases productivity. Batch picking is often used when the typical order profile has only a few SKUs (under four) and the SKUs physical dimensions are relatively small. Just as in zone picking, batch picking requires only one order scheduling window per picking shift. Pick to cart operations, in which, a cart would be loaded with multiple totes or shippers and the picker will make one pass through the pick zone and sort to the pick containers, thereby avoiding unproductive travel. Vertical lift modules (VLM) or carousel operations utilizing the independent zone picking technique, the picker would setup the pick container batch, this would initiate the mechanized pick modules, and the items would be sorted to the proper pick container. This technique is used to optimize the VLM & carousel pods by limiting the number of machine cycles. Every operation manager has a high priority to minimize walking. 1) Picking from both sides of the aisle, use small pick facings. 2) Placing slow-moving items on side aisles which are entered only when needed. 3) Picking many smaller orders in one trip (batch picking). And the last method to minimize walking is by using a mobile pick cart with portable power built in. 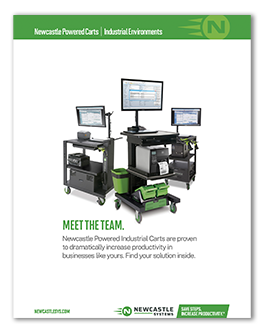 At Newcastle Systems, we provide the latest technology for productivity with mobile carts with built in power supplies which minimizes walking. 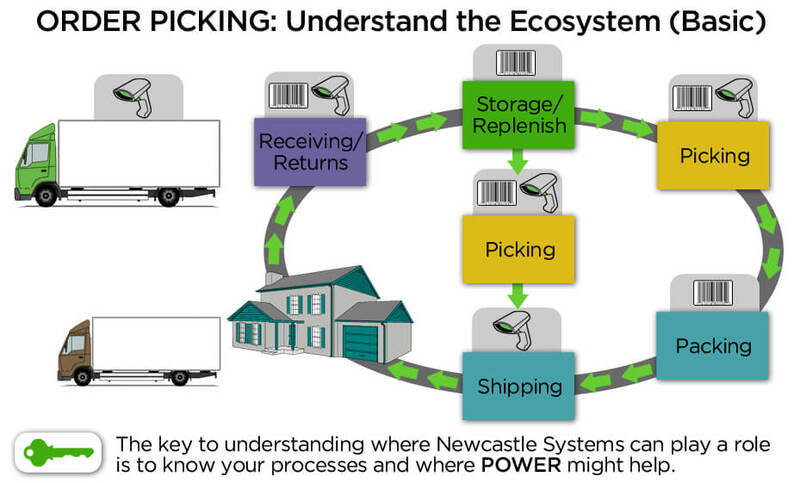 Get immediate access to our new Picking Cart Guide here.